Believe it or not, it’s time to start planning for WisCon 42! As always, WisCon will happen over the U.S.’s Memorial Day weekend — May 25-28. And we’ll again be at the beautiful Concourse Hotel in Madison, Wisconsin. Memberships are now available for WisCon 42! The news this year is that after holding off raising our membership rate for as long as we could, for 2017 we’re increasing the cost of our adult membership to $55. All other membership prices remain the same. Online: Log into (or create! it’s free!) your WisCon account at account.wiscon.net. You can pay immediately via PayPal, or you can choose to mail a check or to pay at the convention. In person: Stop by our Registration desk (2nd floor) and register in person. Child Care (age 0-6) $1 per child. We need to know in advance how many children to expect, so if you plan to use WisCon’s childcare at all, you should register for it ahead of time! Please fill in the age of each child to be enrolled in childcare. Please read the childcare information page for full details. You can also purchase tickets to our Sunday night Dessert Salon through our registration system or in person at the Registration desk. Our Dessert Salon is our fancy-ish Sunday night event, happening right before the Guest of Honor Speeches. There are decadent desserts created for us by the Concourse’s pastry chef and lots of conversation with all the friends you met during the weekend. Because the Dessert Salon is intended to be a fancy-ish event the price reflects that. Money that we bring in from the salon not only covers the cost of the event but goes to support WisCon in many ways, including such things as our accessibility and affordability initiatives. However! We also want everyone who wants to join us have the chance, and so Dessert Salon tickets are available on a sliding scale! Our recommended cost is $25 per ticket. This is a little more than the base cost of the event to WisCon. The sliding scale is $15-$50 — accommodating those who have a tight budget and those who may have some extra cash on hand and would like to support the salon and WisCon. At the Concourse front desk. At 9am on Sunday there will be a reservation agent at the desk to assist you. Online using the Concourse’s reservation system. The cutoff date to reserve a room in our discounted room block is April 26 (end of day — 11:59pm). But at WisCon, our badges say so much more. The first line on the back of your badge tells you the name(s) you used during registration — there may be two names listed if you indicated you wanted a specific badge name. This line also lists what type of membership you have (e.g., Adult, Teen, Youth) and how many tickets to the Dessert Salon you purchased (D:0, D:1, D:2, &c.). On the back of everyone’s badge, we also print the contact information for our Safety team. This includes Safety’s phone number and (new this year!) the URL to use to get to Safety’s online reporting form. Are you participating in programming this weekend? Your schedule is also printed on the back! This includes the day, time, location, and title of each programming item. On the front of your badge we print your name as large as we possibly can so that it’s easy to read from a comfortable distance. Under your name (much smaller) we print you home city, state/province, and country. And that, in a nutshell, is the stock WisCon badge. Pronoun stickers at WisCon 40. We also provide — available at our Registration Desk whenever you’d like to stop by to take them — pronoun stickers. This year’s stickers include she / he / they / e / xe / ou / ze / zie. As well as “any pronouns” and “singular they is always grammatical”. You can absolutely choose to not wear a sticker. You can choose to wear multiple stickers! You can change your sticker(s) throughout the weekend if you want! And if you don’t see the pronoun you need, please email us and we’ll try to get one custom printed for you: registration@wiscon.net If you’d like to know more about our pronoun stickers, this post from last year does a great job of covering the etiquette and protocol of navigating pronouns. A full set of interaction cards at WisCon 40. Our interaction indicators are an idea that comes from the autism community, and we are proud to offer them for everyone who feels it’s helpful to give folks some guidance on the best way to approach you in any given moment. The cards are designed to fit into your badge holder right behind your badge, with the top portion sticking out to indicate which interaction you prefer. Here’s a quick guide to how to use the cards. First, take the whole set! You’ll need all of the cards — red/hexagon, yellow/triangle, green/circle — for the system to work. Each of the cards is marked in three ways: by color, by symbol, and with text that spells out the name of the color. Yellow / triangle: I only want to talk to people I know in person — not strangers or people I only know from the internet. Green / circle: I would like to talk to people, but I may have trouble initiating conversation. Please respect these badges! It’s okay to mess up at first — you’ll soon learn to look for them and follow their cues. 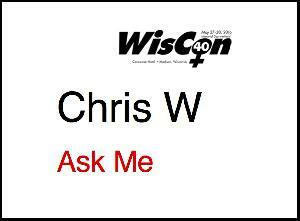 “Ask Me” — now in button format for WisCon 41! Who are these folks with the teal/turquoise buttons that say “Ask Me”? These are concom members and other long-time WisCon attendees who have volunteered to share their vast wealth of WisCon information. Have a question about WisCon? “Where’s the Con Suite?” “When is the Tiptree Auction?” “Can I register for next year’s WisCon yet?” “Which way to the pool? ?” Anyone wearing an “Ask Me” button can likely answer any of these questions — and many more! Don’t be afraid to ask! As much as possible, WisCon reuses its badge holders from year to year. This saves us money and reduces waste, which is important for our commitments to affordability and sustainability. This also means that we ask you to please not affix stickers to your badge holder. Please stick them directly on your badge! And we also ask you to please not stick convention ribbons on your badge. We especially ask those of you planning parties or readings, and so forth, to not have badges for your event. Yes, badge ribbons look totally awesome! An amazing technicolor convention coat of sorts! But… then we can’t re-use the badge holder, and we’d really like to. So please, as much as it’s possible, keep your badge holder in pretty good shape and return it to the Registration area as you leave WisCon this year. If you forget or something unspeakable happens to your badge holder, no harm done. We’ll have one for you next year! WisCon is less than two weeks away! Here are some updates and upcoming deadlines you’ll want to know about as Memorial Day weekend draws ever nearer. Want to make sure you have a pre-printed badge waiting for you at the convention? Online registration is still open! You can pay right away via PayPal. Did you know you can register now online and then pay in person at the Registration Desk? You can! This is a good option if you want to ensure that you’re registered and have a printed badge, but would rather pay in cash. We do cap membership at 1,000, and we make no guarantees that memberships will be available at the door, but this year chances look pretty good for at-the-door memberships. The Registration Desk at WisCon 40, staffed by the friendly Sheree (left) and Lenore (right). Yes, Friday and Monday are FREE! WisCon offers Childcare at a cost of only $1 for children ages 0-6 — but you do need to register them in advance! Childcare registration closes on Monday, May 15, along with online registration. You can register your child for Childcare by logging into your WisCon account and using the registration system. Huge news for reservations at the Concourse hotel — we now have a 24-hour cancellation policy! Our room block with the Concourse used to come with a full week cancellation policy, but that’s been changed starting this year. If you need to cancel your Concourse reservation, you can now do so with only 24 hours’ notice before your reservation begins. If you wait too long to cancel your reservation, you will incur a cancellation fee. Get ready for WisCon 41! It’s 9am on the Sunday morning of WisCon, and that means — if you’re ready to starting thinking about WisCon 41, then so are we! WisCon registration is open for you to buy your membership! Memberships remain $50 for adult memberships for another year. The Concourse reservation system is available for you to book your room. If you’re at the Concourse today, there’s also a reservations agent at the front desk who can help you book your room. Idea submission is open! Sometimes your best programming ideas for next year’s WisCon happen during this year’s convention. This year we’re also opening Guest of Honor nominations at the same time! WisCon is a convention of hundreds of people, dozens and dozens (and dozens) of programming items, a few decades of traditions, and even several pretty brand new things. Whew! What’s a body to do when things are confusing and opaque? Ask Me! About a dozen members of WisCon’s convention-planning committee have volunteered to be wandering FAQs. When does the Tiptree Auction start? Where are the all-gender toilets? Which way do I go to find the Concourse’s Assembly room?? Our Registration / Info Desk on the 2nd Floor of the Concourse is available, of course, to answer all your questions general and specific about WisCon. And if you’re a panelist/moderator, the Green Room is at your disposal for panel-related questions. But if the Registration Desk is closed or you just happen to see a member with an Ask Me badge while you have a question on the tip of your tongue, then please! Go ahead and ask us. Registration update — including free day passes for Friday and Monday! But if you still haven’t quite made up your mind if you’re coming this year, don’t worry! We will still have at-the-door memberships available when Registration opens at 9:30am on Friday. We also offer day passes for all four days of the convention. Friday and Monday day passes are now FREE. Yes, $0! ZERO. So if you’ll be in the Madison area over Memorial Day weekend and you’re interested in checking out this feminist science fiction convention you’ve heard about, please swing by on Friday or Monday for a visit! Friday would be an especially great day to get a taste of WisCon because there’s The Gathering on Friday afternoon, followed by some of our famous panel programming, Opening Ceremonies, and evening parties (and more panels)! Monday is a more low-key day, with panels only in the morning and both the Dealers’ Room and Art Show wrapping up around lunchtime, but Monday is also when the SignOut happens if you’re interested in getting any books/comics/&c. signed. WisCon is only a week away now and we get more and more excited as each day gets crossed off the calendar! We are really looking forward to seeing all of you who will be joining us this year to honor Sofia Samatar, Justine Larbalestier, and Nalo Hopkinson, and to celebrate 40 years of smashing the patriarchy with science fiction! Registration: Log into or create a WisCon account at account.wiscon.net. Child Care (age 0-6) $1 per child; requires pre-registration. Please fill in the age of each child to be enrolled in childcare. Please read the childcare information page for full details. Dessert Salon tickets (before Sunday night GoH speeches): Pay as you can, sliding scale between $15 and $50, with a suggested amount of $25. These tickets usually sell out in early May, though some may become available Sunday afternoon. Though Friday and Monday memberships are free, they are still subject to our 1000-member cap, so we do ask that you check in at the registration desk to confirm that one-day memberships are still available, and to receive a badge. Complete the online registration form by visiting account.wiscon.net, or by following the link at the top of this page. If you haven’t registered in the past, you’ll need to create an account. Once you’ve completed the registration process, you can pay immediately via PayPal, mail a check payment, or pay at the door using cash, check, or a credit card. Mail payment to WisCon, PO Box 1624, Madison, WI 53701. If you are unable to attend, refunds are available until May 15. You may opt at any time to defer your membership or dessert salon ticket to a future year, or to donate your membership of dessert salon ticket to the WisCon Member Assistance Fund. Both full-weekend memberships and single-day memberships can be purchased at the door, along with tickets for the Sunday night Dessert Salon if they are still available. We accept payment via cash, personal check, and credit/debit card. Registration is capped at 1,000 members. We cannot guarantee availability of at-the-door memberships. Online reservations are now open for WisCon34. Hotel reservations for WisCon34 are now open for both the Inn on the Park and the Concourse Hotel. The Concourse now offers online reservations for your convenience. Details to register at both hotels are available on the hotel information page.